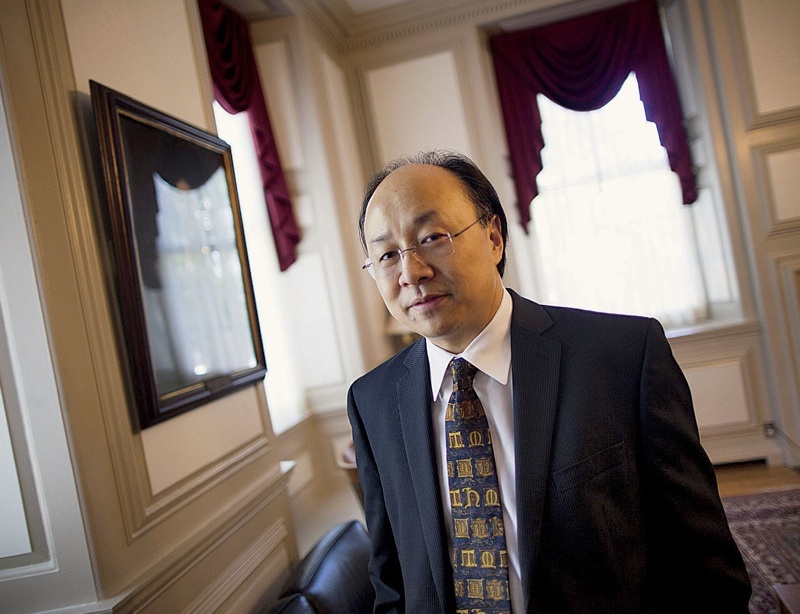 Jones professor of statistics Xiao-Li Meng, Ph.D. ’90—a member of the faculty since 2001 and chair of his department since 2004—has been appointed dean of the Graduate School of Arts and Sciences. He succeeds Allan M. Brandt, who relinquished the position last Febuary to address health issues. Meng has been recognized as a faculty champion for improving teaching and learning, a priority of rising importance for the Faculty of Arts and Sciences and Harvard generally. A graduate of Fudan University, in Shanghai, he is also engaged in, and a potent symbol of, the University’s global reach. For a full report, see http://harvardmag.com/meng-12 . The Office of Research Integrity in the U.S. Department of Health and Human Services has concluded that former professor of psychology Marc Hauser “engaged in research misconduct.” The agency’s finding, based on its investigation and a prior one by the Faculty of Arts and Sciences, comes after FAS in 2010 found him “solely responsible” for “eight instances of scientific misconduct.” Hauser resigned in 2011. The federal findings include fabrication of data, falsified coding of research, and false descriptions of methodology, among other issues. According to the federal report, Hauser “neither admits nor denies committing research misconduct” but “accepts” that the investigatory agency “has found evidence of research misconduct.” He has entered into a voluntary settlement governing any federally funded research he may undertake during the next three years. For a full report, and the text of the federal findings, see http://harvardmag.com/hauser-12 . In the wake of violations of federal rules for care of animals used in research—including several monkey deaths (see “Animal Research Reforms,”  May-June)—Harvard Medical School dean Jeffrey S. Flier has accepted and is implementing an outside review panel’s recommendations for changes in staffing, procedures, and policies at the New England Primate Research Center and elsewhere across HMS operations. The actions include appointment of an attending veterinarian and biosafety officer at NEPRC; staff training and career development; and staffing to bring NEPRC needs and issues to the attention of senior HMS management. In mid September, the Boston Globe reported that HMS and the primate center had been put on probation in June by the Association for Assessment and Accreditation of Laboratory Animal Care International, the principal accrediting organization for animal-research institutions. In mid August, the University, joined by several other institutions, filed an amicus brief in Fisher v. University of Texas at Austin, the latest legal case concerning consideration of race in higher-education admissions; oral argument before the U.S. Supreme Court is scheduled for October 10. The institutions cited the “profound importance of assembling a diverse student body—including racial diversity—for their educational missions.” For a detailed account of litigation over these issues, a report on the current brief, and texts of briefs, see http://harvardmag.com/amicus-12 . Yale president Rick Levin announced on August 30 that he would step down at the end of the academic year, bringing to a close a 20-year run—the longest among current Ivy League presidents and among leaders of the member institutions of the Association of American Universities.…Shirley Tilghman, president of Princeton since 2001, announced in September that she, too, would step down next June.…Cornell and MIT have modified their financial-aid policies. Cornell now restricts “no-loan” aid packages to families whose income is $60,000 or less; previously, the ceiling was $75,000; between those levels, aid offerings now include a $2,500 annual loan component, scaling up to $5,000 (previously $3,000) for families with incomes from $75,000 to $120,000. MIT moved to a uniform “self-help” level of $6,000 for aid packages at all incomes, to be met through work-study assignments, outside scholarships, or loans; previously, the obligation for families with incomes under $75,000 was slightly less than $3,000. Applied mathematician and theoretical economist Eric S. Maskin ’72, Ph.D. ’76, who shared the Nobel Prize in 2007 (with Leonid Hurwicz and Roger B. Myerson, Ph.D. ’76), has been named Adams University Professor, Harvard’s highest faculty rank. He succeeds Christoph Wolff, a musicologist and and scholar of Bach and Mozart, who has retired. Maskin taught at MIT and at Harvard (from 1985 to 2000) before relocating to the Institute for Advanced Study, in Princeton, New Jersey. He returned to the faculty this past January. The Graduate School of Arts and Sciences conferred its Centennial Medal on Maskin in 2010.
rotc’s return. Now that Reserve Officers’ Training Corps programs are formally recognized by Harvard (navy and army offices opened last academic year), Army ROTC cadets began calisthenics training at University facilities on September 10—the first time such activity was sanctioned on campus in 41 years. An introductory military-science class began later that week. Tips litigation. The Harvard Club of Boston reached a $4-million settlement with waitstaff over tips collected as part of a surcharge on food and beverage bills, the Boston Globe reported in September; the funds collected had not been disbursed to employees, as required by Massachusetts law. The employees were represented by Shannon Liss-Riordan ’90, J.D. ’96. On September 20, she filed a class-action lawsuit against the Harvard Faculty Club, maintaining that staff there had also been illegally deprived of funds that club patrons paid, expecting them to be disbursed to servers as tips. Rugby rises. The athletics department has announced that women’s rugby, a club sport since 1982, will become a varsity sport in the 2013-2014 academic year—bringing to 42 the number of varsity programs for men and women (21 each). The National Collegiate Athletics Association has identified women’s rugby as an emerging sport, signaling its potential as a recognized intercollegiate program. Harvard’s will be the first Ivy League varsity program. For more on the program’s history at Harvard, see http://harvardmag.com/rugby-12 . Research leader. Richard McCullough, vice president for research at Carnegie Mellon—where he formerly chaired the chemistry department—has been appointed Harvard’s vice provost for research, effective October 15. He oversees interdisciplinary research, research administration and policy, and research funding. McCullough, a materials scientist, succeeds professor of pathology David Korn, who led efforts to overhaul University financial conflict-of-interest policies. Extension executive. Michael Shinagel is stepping down as dean of the Division of Continuing Education (Harvard Extension School, Harvard Summer School, the Institute for Learning in Retirement, and other operations) at the end of the academic year. He has led the organization since 1975, and was also master of Quincy House. The Faculty of Arts and Sciences will conduct a national search for a successor. Political principals. Several Harvard-affiliated people played prominent roles in the national political news this summer—alongside President Barack H. Obama, J.D. ’91, and Republican challenger Mitt Romney, M.B.A. ’74, J.D. ’75. Thomas Stemberg ’71, M.B.A. ’73, a founder of the Staples office-supplies retail chain and now a venture capitalist, spoke at the Republican convention in Tampa on Romney’s behalf. Rafael Edward (“Ted”) Cruz, J.D. ’95, former solicitor general of Texas, a Tea Party-backed challenger, secured the Republican nomination, and all but certain election, to a U.S. Senate seat from that state. And a front-page New York Times story on July 15 described the role of former Overseer Penny Pritzker ’81 as a leading Obama fundraiser in 2008 and her lessened involvement in this campaign. Miscellany. Behavioral economist Alvin E. Roth, and economics professors Susan C. Athey and Guido W. Imbens (the latter are husband and wife) all relocated from Harvard to Stanford during the summer. Also on the road: number theorist Sophie Morel, the only woman full professor in the mathematics department, who came to Harvard from the Institute for Advanced Study, is now at Princeton.…Cecilia Rouse ’86, Ph.D. ’92, a professor of the economics of education at Princeton, has been appointed dean of that university’s Woodrow Wilson School of Public and International Affairs. She served on President Barack Obama’s Council of Economic Advisers from 2009 to 2011.…MIT’s past president, Susan Hockfield, is serving as a visiting professor at the Harvard Kennedy School’s Belfer Center for Science and International Affairs. Also at the Kennedy School: Michael Ignatieff. He was Carr professor of human rights policy from 2000 to 2006 before returning to his native Canada, where he was elected to parliament and led the Liberal Party. He is now a half-time professor of practice.…Paul Andrew, formerly of the Weber Shandwick public relations firm, has been appointed Harvard’s assistant vice president for communications, effective October 1. His previous clients included Harvard Business School and edX, the Harvard-MIT online-education enterprise launched last spring.…Caesars Entertainment is pursuing a license for a Boston-area casino development with Suffolk Downs, the racetrack on the East Boston-Revere line; Harvard Corporation member Joseph J. O’Donnell ’67, M.B.A. ’71, is a Suffolk Downs principal owner.